Grand Theft Auto: Chinatown Wars is a Rockstar Leeds game for the Nintendo DS, Sony PSP, and Apple iOS (iPhone/iPod Touch/iPad). It was released for the DS in North America on March 17, 2009, and March 20, 2009 in Europe. It became available on PlayStation Portable on October 20th 2009. The game is set in Liberty City - a year after the events of Grand Theft Auto IV, with a story now focusing on the Triads, and protagonist Huang Lee, the twenty-five year old nephew of Lee Family head Wu Lee. In addition, the separate state of Alderney does not appear in the game. Announcement of GTA Chinatown Wars. Huang Lee, the game's protagonist. The rendition of Liberty City used in GTA Chinatown Wars. Note the absence of the state of Alderney. Huang Lee, the spoiled son of a recently murdered Triad boss, arrives by plane in Liberty City with Yu Jian, a sword that Huang's father won in a poker game and has decided to use as an heirloom, to deliver it to the new patriarch of the family, Huang's uncle Wu "Kenny" Lee. Shortly after landing, Huang's escorts are killed by assassins and he is shot (a bullet grazes the side of the head but he survives) and kidnapped. The assailants steal the sword and, thinking Huang is dead, dump his body in the water. Huang manages to survive and informs Kenny that Yu Jian has been taken. Kenny explains that he had intended to offer the sword to Hsin Jaoming, the aging Triad boss in Liberty City, as a means of securing a position as his replacement. Kenny is been dishonored and been reduced in power due to the loss of Yu Jian, leaving him and Huang working to keep their businesses afloat. Eventually, Huang is contacted by Zhou Ming, a high-ranking Triad member, and Chan Jaoming, son of Hsin. Both men are also competing to be Hsin's replacement, and employ Huang to combat each other's efforts. After Chan hires Huang for a deal that goes badly, LCPD Detective Wade Heston, a crooked cop under pressure from Internal Affairs, intercepted Huang. Heston offers an alliance with Huang to find the men responsible for the theft of Yu Jian and the murder of Huang's father. Huang agrees and finds that Heston suspects a Korean gang allied with the Triads is behind the events. After combating the Koreans for a while, Heston plants a bug in the Koreans' headquarters, from which he learns that there is a splinter group inside the gang called the Wonsu Nodong. Heston determines that the leader of the Wonsu will be the one responsible for Yu Jian's theft, and is a police informant who has been causing trouble for the Triads. Meanwhile, Hsin enlists Huang in finding the informant, only to then suspect Huang himself and attempt to kill him. Kenny arrives and convinces Hsin to give them time to find the real rat, bringing haste to Huang's mission. Hsin puts Huang on to investigate two gangs who may be housing the rat: the Angels of Death, and the Korean Mob. Huang gets into contact with Lester Leroc, a PI inside the Angels of Death, and performs his own work against the Koreans. Huang is been temporarily thrown off course by the intervention of mafia member Rudy D'Avanzo, who tricks Huang into believing the mole is a Messina Family member named Jimmy Capra. Hsin later reveals D'Avanzo's trickery and Huang kills him. Both the Koreans and the Angels are been found to be innocent, leading to a new course of investigation. Heston employs Huang to hack into the servers of the FIB in order to find the informant. The information recovered names both Zhou Ming and Chan Jaoming as having talked to the police about Triads. This is been taken to Hsin, who, disgraced that his own son is a suspect, instantly steps down as leader and appoints Kenny as the new head of the Liberty City Triads. Huang then executes both Chan and Zhou, despite each denying their guilt. Shortly after the killings, Heston, who informs him the information they recovered was fake, and that he has learned of a meeting between the leader of the Wonsu and his allies, contacts Huang. Huang and Heston go to the meeting and find Kenny, who admits that he was responsible for the theft of Yu Jian and Huang's father's death. Heston and Huang pursue Kenny across town, cornering him at Hsin's residence. Here, Kenny explains that he was tasked by Hsin to retrieve Yu Jian, thus Huang's father would have to die for it to be passed on to him, in exchange for a position underneath Chan. Kenny complied with this, but attempted to have Yu Jian stolen to keep himself from such a dishonorable position and later framed Zhou and Chan to cover his tracks. After a final confrontation between Hsin and Kenny, Hsin demands the hand over of Yu Jian. Kenny ironically responds by stabbing Hsin with the sword as his way of presenting it to him. With Huang as witness to the murder and truth, Kenny engages in an inevitable final battle with Huang, who is the only one left in the way of Kenny's undisputed rise to power. Centered on a fountain with Kenny slashing away, Huang eventually kills Kenny, fulfilling his promise to avenge his father. Immediately the IAD and FIB arrive to arrest Heston and Huang, however Heston claims that he was in deep undercover and orders the arrest of everyone except Huang. Hsin praises Huang with the loyalty and nobility to become his true successor as Triad Boss. By completion of the story and locating the two Lions of Fo for the Rockstar Games Social Club, you can open up Xin Shan's missions. Xin instructs Huang to steal a Rhino to distract the police from a planned robbery. However, the cops ambush Xin; Huang attempts to take him to safety, but he succumbs to his injuries. Before his death, he makes the revelation that he is the brother of Ling Shan, a girl who was murdered early on in the game. Huang mourns for both of them. Chinatown Wars has a different presentation than any previous game in the GTA series. 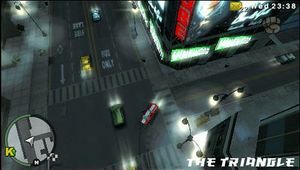 Instead of a third person ground-level view behind the protagonist (GTA III - GTA IV) or a top-down perspective (GTA 1, GTA 2, GTA Advance), Chinatown Wars uses a fully rotatable aerial camera angled down at the action. This angle allows the camera to rotate dynamically during action sequences, and is only featured in this game out of the entire GTA series. The game uses a basic lock-on system for combat, which yields variable results, as sometimes the system locks on to vehicles instead of enemies. The game also locks on automatically when using melee weapons. One of the main features of the game, which distinguishes Chinatown Wars from the rest of the series, is the PDA. This is where many of the game's features are been accessed from, including the Ammu-Nation online shop and Trade Info, which is used in the drug dealing side feature. The PDA is also how the protagonist receives missions in the game in the form of emails, which is a nice substitute for the lack of voice acting in the game. One major difference between Chinatown Wars and previous games in the series is the inclusion of "hot-wiring" mini-games that the player must complete in order to start stolen parked vehicle. Failing to complete the mini-game within a specific time results in the vehicle's alarm being activated, compared to previous games which automatically sound the alarm in randomly selected vehicles. GTA IV introduced the requirement for cars to be hot-wired, but the protagonist still does this automatically. In all games previous to GTA IV, the car seemed to be started with a key, even if it was stolen from a parked position. Chinatown Wars re-introduces over-the-top gameplay, like in GTA San Andreas, GTA Vice City and The Ballad of Gay Tony. The player can once again obtain and use weapons such as the Minigun, Flame Thrower, and Chainsaw. The game also re-introduces vehicles such as the Rhino, Bulldozer and the Speeder. There has been some controversy over a drug dealing minigame, along with comments that some Nintendo games are being aimed at children. 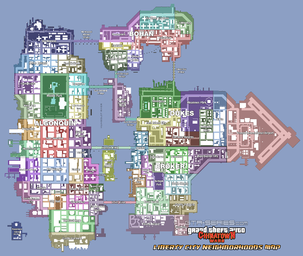 The drug dealing mini-game allows the player to peddle six types of drugs around the city, but the profit made depends on market conditions, which will be based on the area in which the player deals, and the amount of service this area receives regularly from the player. A screenshot of the PSP version, showing the enhanced graphics. 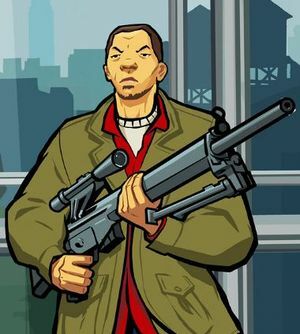 In October 2009, GTA Chinatown Wars was released and features new missions, given by Melanie Mallard. The graphics have been improved and, due to obvious differences between the two consoles, all the action was condensed to the one screen, with the touch screen minigames replaced by quick time events. The PSP version includes a more diverse soundtrack of 11 radio stations, compared to five in the DS version. An Apple iPhone version of Chinatown Wars was announced on 31st August 2009, and on 18th January 2010, was released on the App Store. It costs $9.99. The graphics has been updated with better colour and textures, a mix between the DS and PSP styles. It also features Independence FM, a custom radio station, where players can create a playlist of their favorite iTunes songs. The initial release required 186MB of storage memory on the iPhone/iPod touch  and included the same soundtrack radio stations as the DS version. Since 28th March 2010, an updated version includes the six radio stations that were exclusive to the PSP version. The additional music increased the size of the game to 232MB. On June 9, 2010 Take-Two Interactive revealed that an iPad version would be released within a month. A free demo version for the iPhone/iPod Touch/iPad was released around the same time as the full game. It features the first three missions (Yu Jian, Pursuit Farce and Under the Gun) and full access to Liberty City. All radio stations were removed, with the exception of Deadmau5 and Ticklah ; also, a substantial number of in-game services like Auto Merchant and Drug Dealing were removed. If the player purchases Grand Theft Auto: Chinatown Wars for the Nintendo DS, they will be provided with a booklet called Your New Life In Liberty City. It shows the controls, safehouses, PDA, weapons, Side missions, multiplayer mode, co-op mode, social club, as well as a few funny advertisements. Chinatown Wars is the third Grand Theft Auto game released on the PlayStation Portable (PSP) after Grand Theft Auto: Liberty City Stories and Grand Theft Auto: Vice City Stories, and the first GTA game to appear on the PSP to not get a PlayStation 2 port. 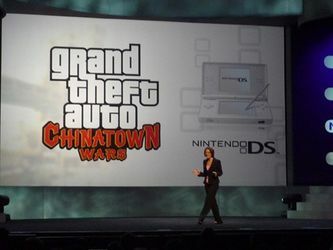 Chinatown Wars is the first GTA released on the Nintendo DS as well as Apple's iOS platform. It was stated in the UK magazine Official Nintendo Magazine that this game contained at least 800,000 lines of code. If one had pre-ordered the game from GameStop, they were provided a cheat code that allows players to unlock all the weapons at Ammu-Nation and receive $10,000 early in the game, or the ability to acquire a bullet-proof Infernus at the Auto Merchant. All of the bosses in the game have their own theme songs, which occur whenever the player initiates a mission for them. 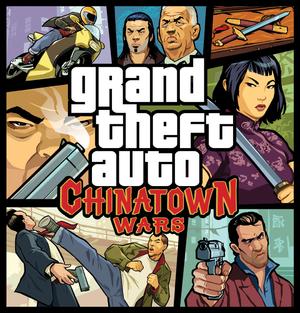 Unlike the covers of nearly all Grand Theft Auto games since GTA III (having few pictures of random actions around the logo), the cover of GTA Chinatown Wars doesn't have a picture of a helicopter in the top left corner, probably because they cannot be flown in the game, and only ridden in one mission. However, the same applies for GTA III: The player cannot fly a helicopter in the game, and they are only ridden in one mission. In the top left, top right, bottom left and bottom right corners of the city (far out into the water), there are signs which say 'Here Be Dragons'. This page was last modified on 28 October 2013, at 15:10.